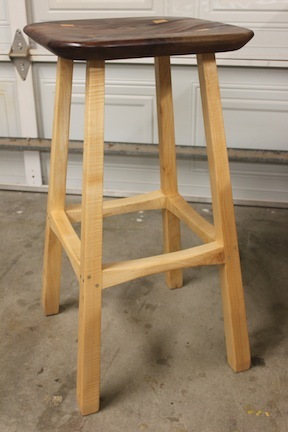 Overall dimensions of the stool are 29.5″ tall with a 15.25″ sq. seat and 16.5″ sq. splay at the base. Materials used were: 8/4 Maple and 6/4 Walnut (possibly Claro, not certain) with 1/4″ Aluminum pins for the stretchers. Finished by wiping on pure tung oil. My greatest challenge was time. I am a stay-at-home-dad of three kids, ages 3, 2, and 1. So my time spent in the shop was at night typically and on the weekend when my wife was gracious to give me the break I needed to get this done. 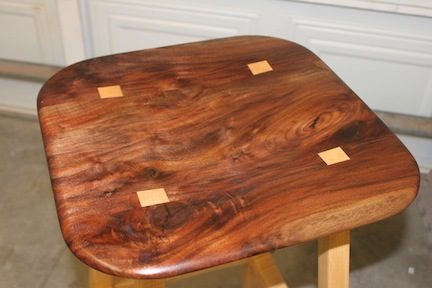 My stool was inspired from the design on WoodWorks with David Marks Episode 112 and my friend, Marc Spagnuolo. I first saw his stool and had to make one. I found David Marks’ plan and started the build after watching the episode about a dozen times to get the order down. This was my first real furniture project aside from making some cabinets and a picnic table for my kids. The stool is made by laminating the legs into the seat. The seat was grain matched to the most pleasing arrangement and then the strips were cut and the 6 deg bevels were cut to make the legs splay out and to the sides. The stretchers were fit one at a time between each leg and pinned for reinforcement. I then shaped the seat with a round over bit and the underside was sculpted with a King Arthur Squire cutting disc. After looking at it a bit longer I felt something had to be done with the feet so I used a rasp to shape the foot to be a little lighter in appearance. I sanded all surfaces to 220 and the end grain on the seat to 320 and wiped on pure tung oil to finish. For the next Build-Off I would like to see something like a Mirror Frame or maybe a unique wall shelf. I had a lot of fun with this, Chris. By the way, it was awesome to meet you at WIA in Pasadena. It is a beautiful piece. You have my vote. I enjoy the contrasting colors. Well done. Shows refinement from all angles. The contrasting colours are elegant. Lovely finish. Sam Maloof would be proud. The seat scoop adding a dimension to the through tenons is something I would have over overlooked on paper. Your picture makes me look at nothing else.This could actually be my spark, thank you sir.